We hope many of you had the opportunity to attend one of our Regional Meetings. Now that winter is on the way and long nights are here it makes you want to start working on projects for the coming year’s contests. Our ten classes in the needlework contest remain the same. Only the theme is new “You’re the Cat’s Meow.” Also our Connecticut CWA has added a new category- Dress A Doll. This is only for our state and winning entries will not go to the Big E. Should be fun. This year for Foster Families we are again asking for Memory Books and also a new gift which we call “Cat Nap Time.” This is a gift of pajamas, toothbrush and toothpaste in a cloth bag, sizes from babies to teens. To Covenant to Care we wish to give Comfy Covers and good toys. (Not from China and sold in Dollar Stores). All gifts to Foster Families and Covenant to Care are to be brought t State Session in October where they will be presented to one o their representatives. Our State Projects for monetary donations along with Connecticut Granger Trust Fund, Student Loan Fund, and Camp Berger Maintenance Fund will be The Foster Teen Fund. This fund provides tickets, rides, etc. for entertainment for the teen-aged foster children. Please donate whatever possible. Keep up the good work. Keep those hands busy and needles flying working on items for the Needlework and Craft Contests. 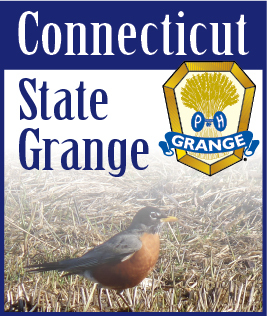 Remember, when you have all that craft and needlework material out please make an extra item for the Grange Country Store in the New England Grange Building at the Big E. It will be much appreciated.